For my long time readers, you'll remember the first edition of this story. For my newer readers, I'll catch you up...Dave sends me gingerbread house kits every year just because he knows how much I loathe them. You might ask why don't I just throw away the kit? Well, because I have kids that have *selective* memories that are better than elephants and they say things like, "Why haven't we made the gingerbread house yet?" and "It's after Christmas and we still haven't made the gingerbread house." and "Remember the gingerbread house? "...you get the point. Dave retired on the 20th of this month from a very illustrious career. He's at least 100 years old, so it couldn't have come at a better time. I'm thinking...what can I get Dave for his retirement? And I have this fantastic idea...get down that kit and make it up and send it to him in a nice, big box. You know, 'cause for guys the best gifts come in *BIG* packages. So, here's to you, Dave. I hope you enjoy your retirement and try not to drive Bev so crazy that she goes back to work. I'm hoping that this is *MY* retirement from gingerbread house construction. ...and just as an added bonus, I'll give you a sampling of the questions I got while making this gingerbread house. "Is Dave going to eat it?" and "what if he is offended because he sent him back the gift he sent you?" and the most commonly asked one, "why are you sending him a gingerbread house?" it's beautiful...except it looks like a sleuth of care-bears defficated in the lawn. by the way - a group of bears is called a sleuth. i looked it up. learn something new every day. Care Bear poop is really quite colorful and sweet looking. They really are evil bears. Thanks for the vocabulary education. 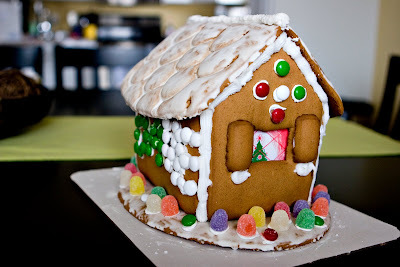 Why are sending Dave a gingerbread house?